I was one of the most pro-marijuana individuals you could ever meet, quite the cannabis enthusiast with vast knowledge in all aspects of the plant, including cultivation. I started consuming marijuana at age16. It helped me cope with the unhappiness and awkwardness of life. Smoking marijuana instantly made me forget family dysfunction. My body and brain felt no pain, my mind instantaneously cozy and happy, enveloped in sunshine warmth. Sure, I had heard that marijuana could cause grades to drop, but mine never did. It didn’t appear to me that marijuana was harmful or addicting in the least. Marijuana in the 1980s was hard to come by, of poor quality, and expensive. In college, at 20 years old, I decided to “grow my own.” It wasn’t a smart idea in Virginia during the War on Drugs. I ended up getting busted with a small grow and was facing a felony with a minimum of 5-25 years. It would have been easy and convenient to cooperate with the police, not been prosecuted or gotten off lightly. However, that plan would have involved informing on other people, against my personal ethics. Because I refused to cooperate, the prosecutor took the toughest stance available. However my lawyer assured me that due to my young age and not having a criminal record, not even a speeding ticket, that I would not be incarcerated. Whew! I was worried about that. 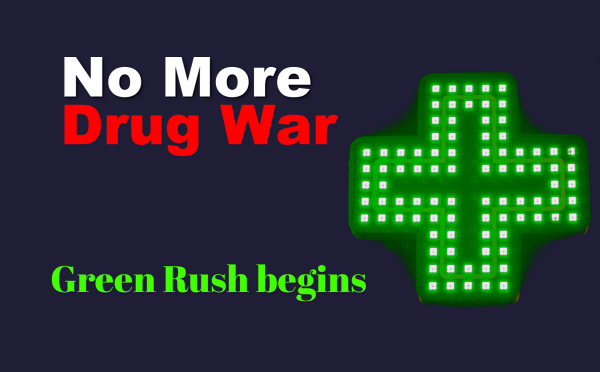 Though Virginia had a felony 1st time offender status for certain felonies, drug charges were not included. I still remember that day in court with my anxious parents by my side, after I had plead “no contest” facing a minimum of 5-25 years in a state penitentiary. Though I knew the prospects were not good, I expected to be sent home before sentencing. It did not bode well with the arrival of the female deputy into the courtroom, just before the judge ordered me incarcerated due to “the heinous nature of the crime.” Say what?! Once incarcerated in jail with 5 years of penitentiary time hanging over my head, I saw the wisdom in admitting to the court officials that I was a regretful drug addict. After a month in jail, I went back to court. My lawyer plead on my behalf, stating that my life would be ruined with further incarceration and a felony record. The District Attorney decided to be merciful towards me. The judge accepted his proposal: release me on probation for a year and if I met all conditions, expungement of the felony conviction. The conditions included including monthly supervised drug screens and probation meetings, and graduating from college. I was elated to be released from jail and faithfully met all conditions of my probation. You may think that I gave up, no longer thinking it was worth bucking the law just for marijuana. Paradoxically, I felt even more justified, that the government had it all wrong. It was persecuting non-violent people with its Reefer Madness oppression. The government was completely wrong about marijuana usage, not me. Fast forward decades, I had no further interaction with law enforcement but used marijuana off and on. Off marijuana when I was engaged in pursuits such as attaining a black belt in Aikido, then a Master’s in Physical Therapy. In the homecare field, I met patients who told me that marijuana was the only thing that helped relieve pain, that they preferred it to pain pills. When California passed “medical” marijuana in 1996, I was elated and hoped it wouldn’t be too long before it came to the East Coast. I voted for MA marijuana decriminalization and “medical” marijuana in 2012. 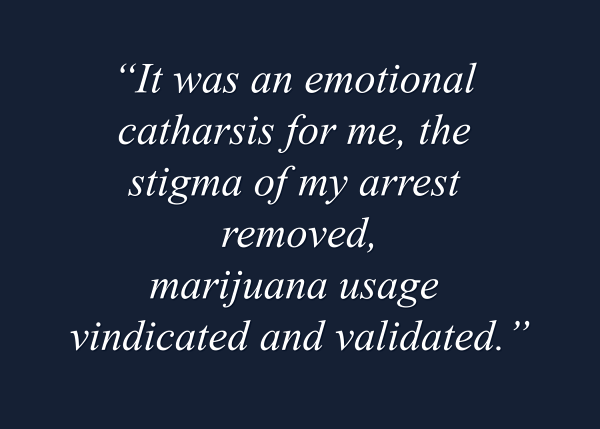 It was an emotional catharsis for me, the stigma of my arrest removed, my marijuana usage vindicated and validated.